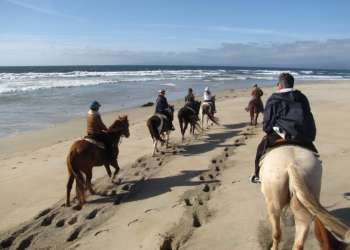 Venture into beautiful Monterey by land or sea! You can take a passive or active role in the Monterey environment through a number of activities throughout the city. For those who want to experience the Monterey Bay Marine Sanctuary first-hand, take a whale watching cruise on Monterey Bay. These cruises are crewed by experienced guides who will point out gray whales, humpback whales, and other exciting marine life. Separate fishing trips take fisherman out to catch the locally available (seasonal) salmon, Pacific rock and ling cod, halibut, tuna and sea bass. Or try a sailing adventure aboard one of Monterey&apos;s finest sailboats. Get an even closer view of Monterey Bay by renting a kayak or taking a guided kayak tour. Kayaks can be rented from locations in Cannery Row or near Old Fisherman&apos;s Wharf, and they are a great way to gain a different perspective on the Monterey seashore. They allow you to get closer to otters, birds, seals and sea lions, and even the tops of kelp forests. (But not too close!) Take an underwater view by renting SCUBA gear and diving in Monterey Bay, one of the most popular diving destinations on the West Coast. The Monterey Bay Coastal Recreation Trail is Monterey&apos;s recreation Main Street. A great way to use "green" transportation between Cannery Row and Old Fisherman&apos;s Wharf, the trail is used by runners and walkers, bikers and in-line skaters. Bikes and 4-person, pedal-powered surreys are available to rent in Portola Plaza near Fisherman&apos;s Wharf and in Cannery Row. Monterey has a number of public parks, and one of the children&apos;s favorites is Dennis the Menace Playground at El Estero Park. This famous playground is known throughout the state for its whimsical equipment, which includes a drinking fountain inside the mouth of a lion, a swinging rope bridge, a roller slide, a life-sized hedge maze and more. Young conductors can climb all over the real steam train engine and pretend they are rolling down the track. Created in 1956 by cartoonist Hank Ketcham, the park celebrates the right of kids to be kids. Nearby, tweens and teens can catch air at the skateboard park.